My tiny and obscure clique on Facebook has reached over 100 'likes' so as promised here's a gift for the members of 'Flower Bomb Songs' page. 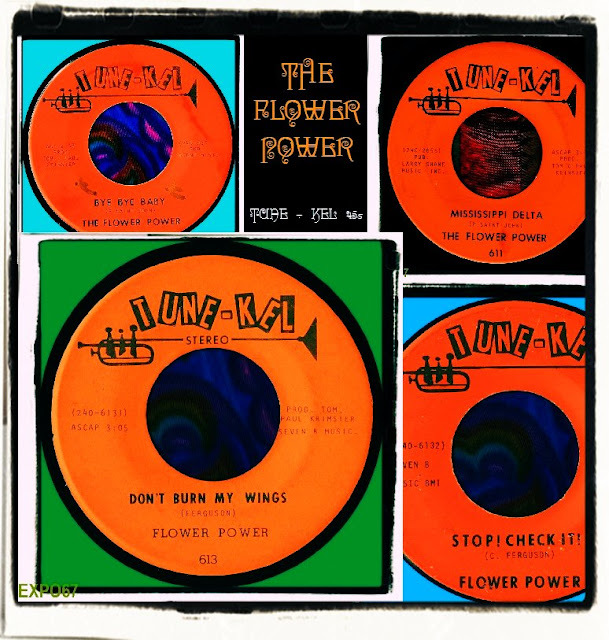 Last year I completed my mission to collect all five 45s The Flower Power released. They were a psychedelic/hippie group from Gulfport, Mississippi and I'm very surprised no label has ever released a collected works on LP or CD. I know from a band member that some recordings they made in Texas have never been released so there is unknown and unreleased items in some long forgotten archives. Anyway, as a World first here's all of their singles remastered by myself direct from original vinyl 45. Try finding them. They're all hard to locate. I've created a front/back cover which is held in the MediaFile folder. This is only available through my Flower Bomb Songs Facebook page. Very cool, downloading now... thank you Colin! So good to hear all these tracks collected together. Great stuff... and super audio quality. Thanks so much for sharing! I searched on the Facebook page and couldn't find it - have you taken it down? Yeah, it's no longer available as I no longer pay for the hosting site it was uploaded to. No plans to put it up anywhere else as a record label are working on re-issuing the material of The Flower Power.